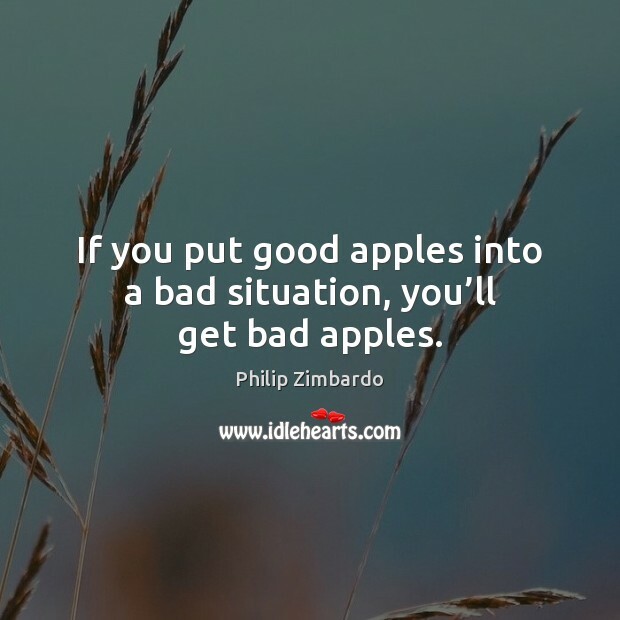 Quotations about Bad Apple. Quotes to stimulate mind and drive action! Use the words and quote images to feed your brain inspiring things daily! 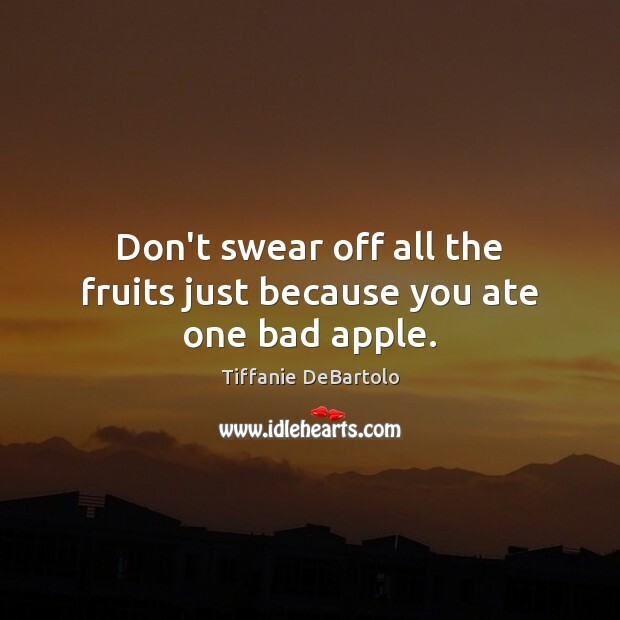 Don't swear off all the fruits just because you ate one bad apple. It's a lot harder to keep your cool than it is to lose it. That's on any work ethic. Even if you're a big producer on a movie set, or whatever, it's a lot harder to be a pro than be a baby on your crew. 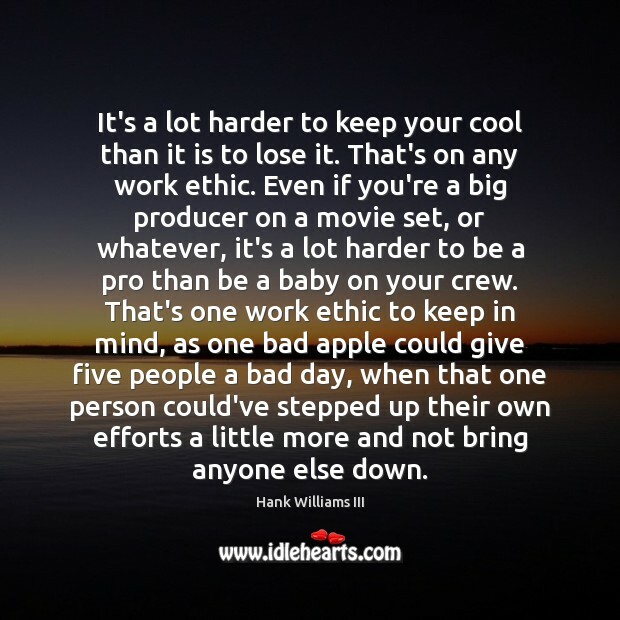 That's one work ethic to keep in mind, as one bad apple could give five people a bad day, when that one person could've stepped up their own efforts a little more and not bring anyone else down. 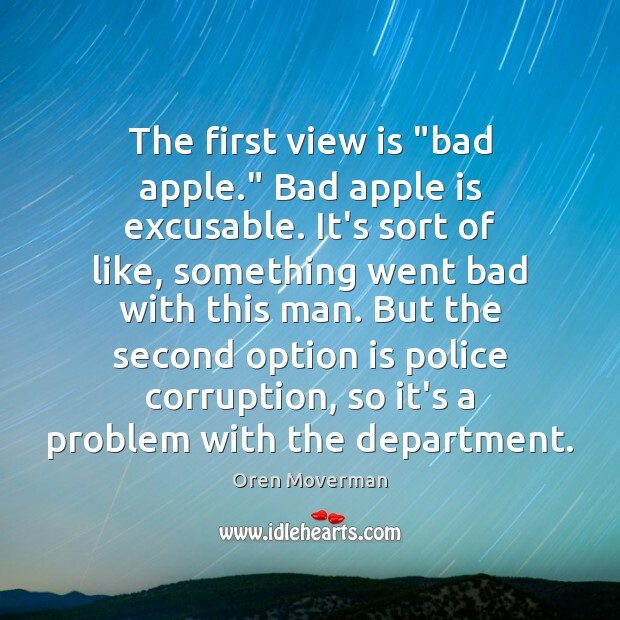 The first view is "bad apple." 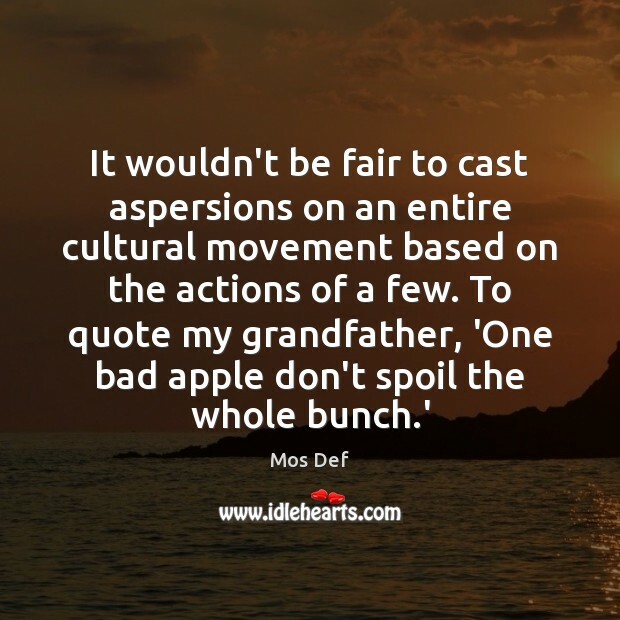 Bad apple is excusable. It's sort of like, something went bad with this man. But the second option is police corruption, so it's a problem with the department. 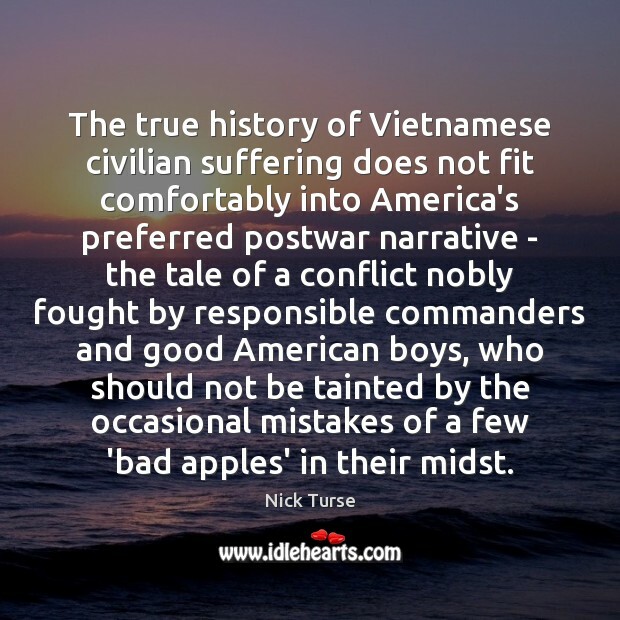 The true history of Vietnamese civilian suffering does not fit comfortably into America's preferred postwar narrative - the tale of a conflict nobly fought by responsible commanders and good American boys, who should not be tainted by the occasional mistakes of a few 'bad apples' in their midst. Is it fair to be suspicious of an entire profession because of a few bad apples? There are at least two important differences, it seems to me. First, no one doubts that science actually works, whatever mistaken and fraudulent claim may from time to time be offered. But whether there are any miraculous cures from faith-healing, beyond the body's own ability to cure itself, is very much at issue. Secondly, the expose' of fraud and error in science is made almost exclusively by science. 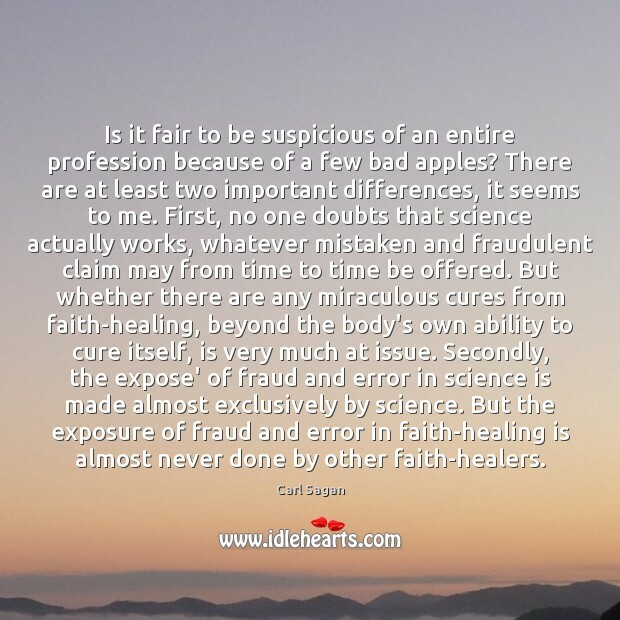 But the exposure of fraud and error in faith-healing is almost never done by other faith-healers. 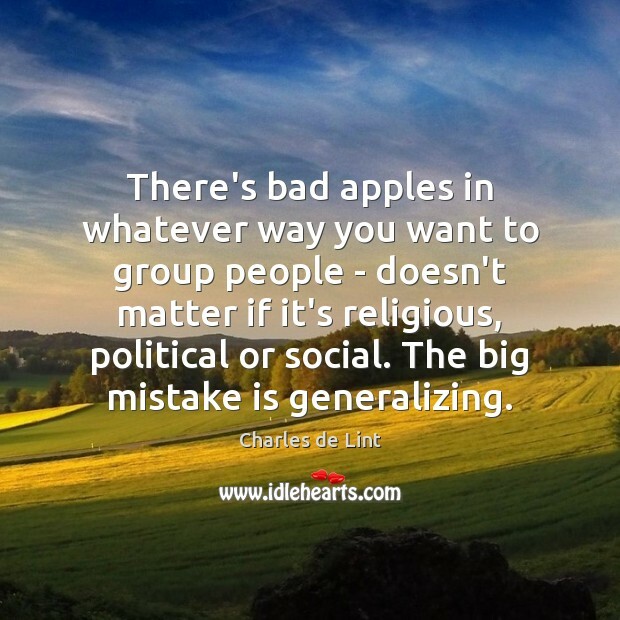 There's bad apples in whatever way you want to group people - doesn't matter if it's religious, political or social. The big mistake is generalizing. 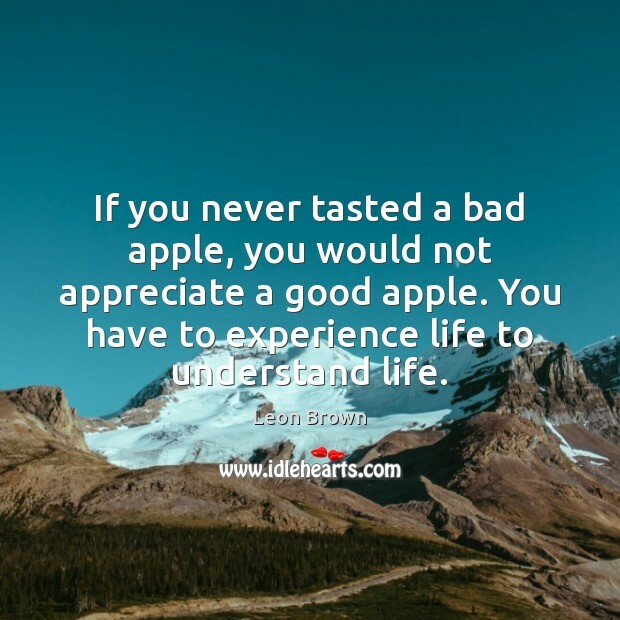 If you never tasted a bad apple, you would not appreciate a good apple. You have to experience life to understand life. 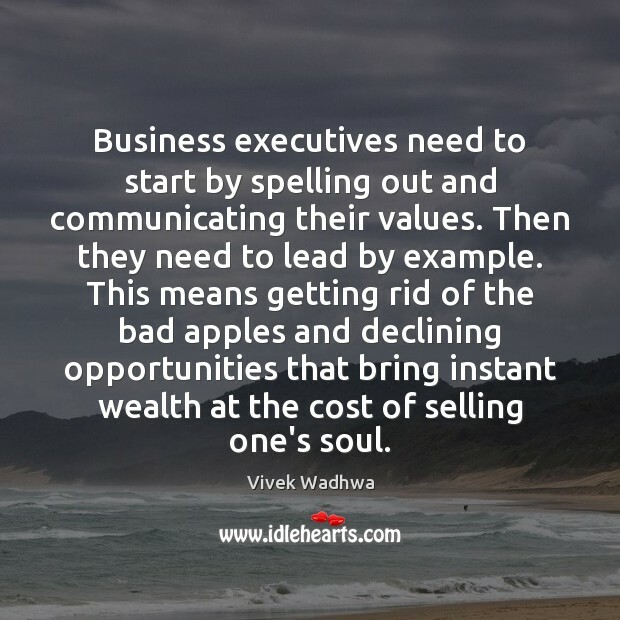 Business executives need to start by spelling out and communicating their values. Then they need to lead by example. This means getting rid of the bad apples and declining opportunities that bring instant wealth at the cost of selling one's soul. 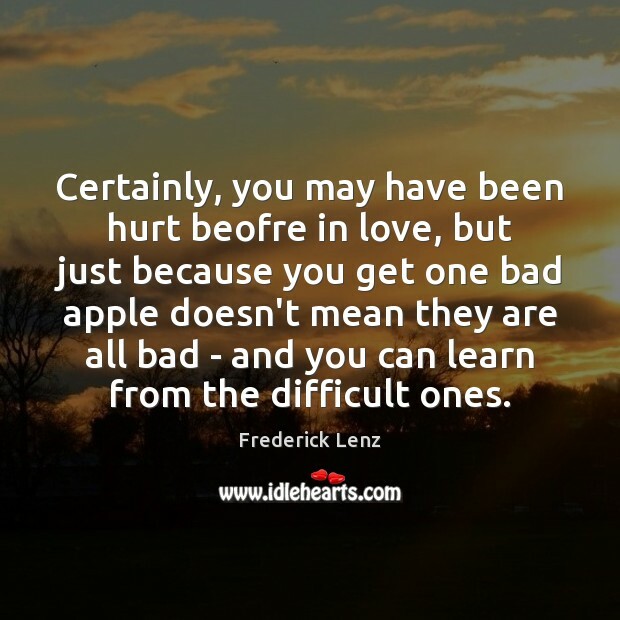 Certainly, you may have been hurt beofre in love, but just because you get one bad apple doesn't mean they are all bad - and you can learn from the difficult ones. 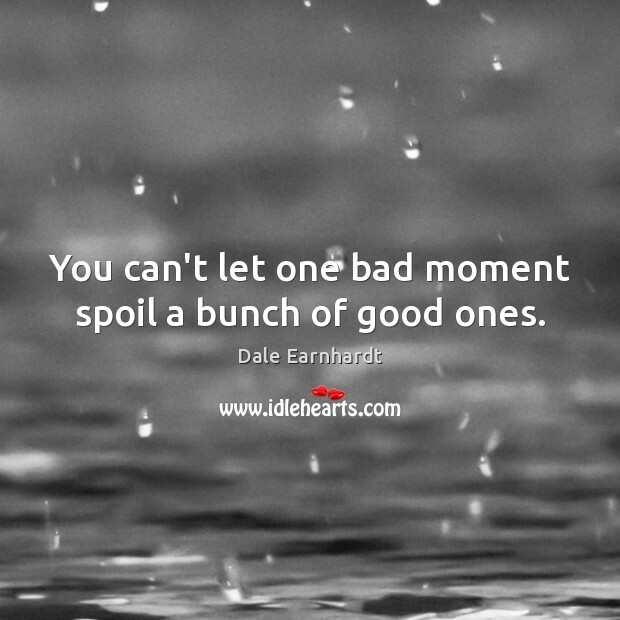 All badness is spoiled goodness. 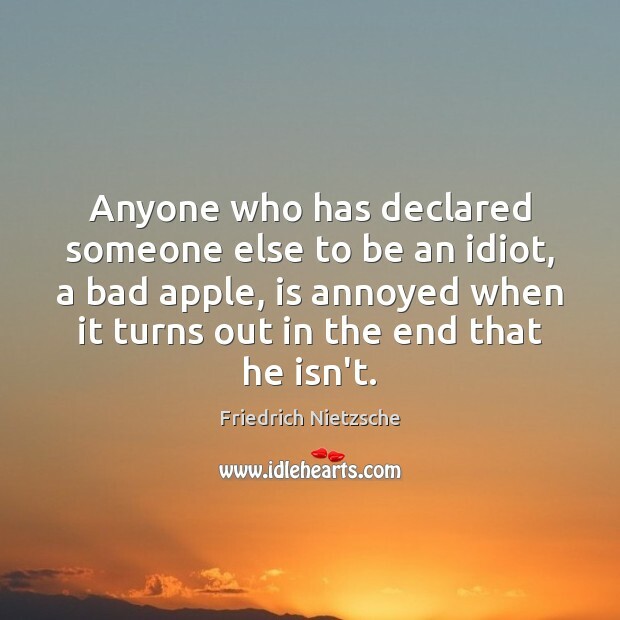 A bad apple is a good apple that became rotten. 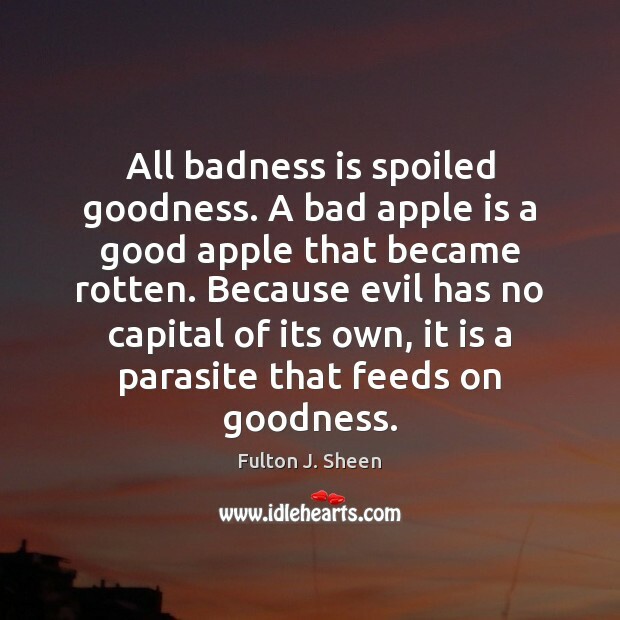 Because evil has no capital of its own, it is a parasite that feeds on goodness. 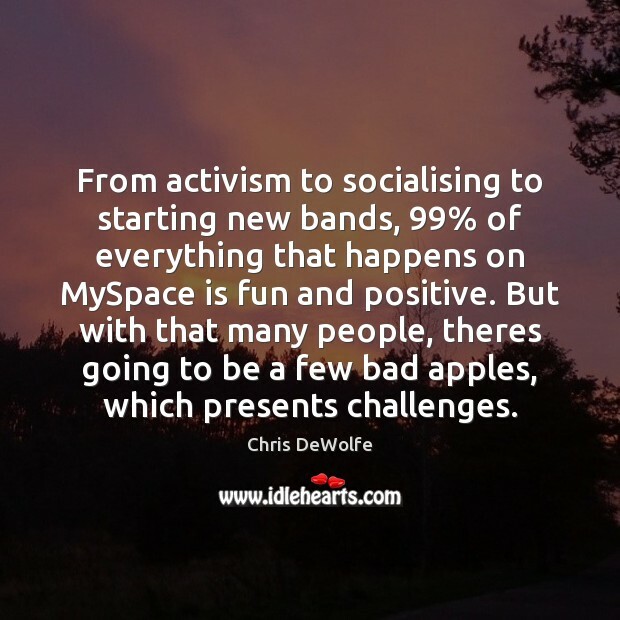 From activism to socialising to starting new bands, 99% of everything that happens on MySpace is fun and positive. But with that many people, theres going to be a few bad apples, which presents challenges. I agree that there are some bad apples on Wall Street. 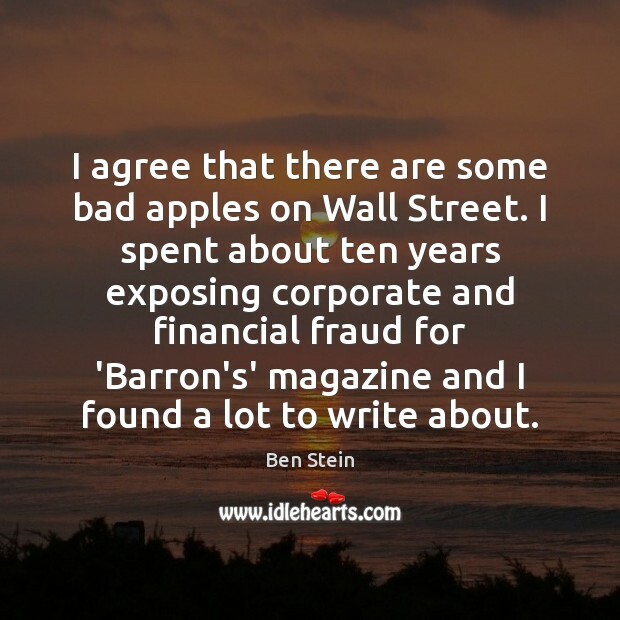 I spent about ten years exposing corporate and financial fraud for 'Barron's' magazine and I found a lot to write about. 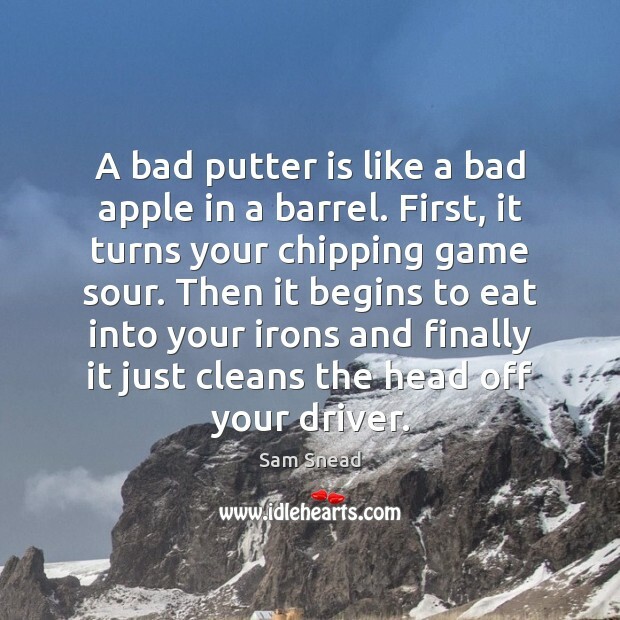 A bad putter is like a bad apple in a barrel. First, it turns your chipping game sour. Then it begins to eat into your irons and finally it just cleans the head off your driver.